I take my cues only from the best: ahem, like JLaw. The movie mildly disappointed me, but I wonder if that wasn’t because I’d just spent every waking hour of this past week catching up on everything to do with The Hunger Games: blew through all three books for the first time (I know, I know! ), rewatched both film adaptations, struggled emotionally to lead a semblance of a normal life when I wasn’t reading, silently applauded Josh Hutcherson from my couch, and watched every HG interview Google had the good fortune to pass my way. The pace of this movie matches that of the book: it’s slow, there’s no denying it. That being said, the acting is still grade-A (perhaps I’m mentioning that in the vain hope that somewhere, somehow, one of the talent has stumbled across this post and will give it a big thumbs up), and Josh’s final performance in particular sent tiny cold waves up my spine and right over the nape of my exposed neck. They’ve done a great job bringing the book’s trauma to life, and goodness knows I’m empathizing 110% with Katniss’s confusion about the two boys in her life because #boys. At a vastly different level, though, the movie reminded me of issues closer to home: all the nameless faces who wander our local thoroughfares and drag along their hollow stomachs with empty eyes. I always find it incredibly difficult to reconcile their reality with my illusion of reality, and the repeated refusals of food by the homeless who will only accept my money don’t only confuse me. They break me. How many times have we stuffed ourselves to bursting like the folks from the Capitol, wishing we could fit down just one more mouthful or that our jeans would expand just one more inch? I’m not advocating complete abstinence on Thanksgiving Day–a day of plenty, and a day of mutual thanks for that abundance–but this year I’m making a point to remember that what doesn’t get eaten at the Thanksgiving table can always be enjoyed the next day. And the next. We’re lucky enough in that respect, so why not celebrate it instead of suffering the agony and throes of overindulgence? It’s appropriate, then, that I’m incredibly thankful I can share this dish with you on this wonderful Sunday Supper: a dish that I’m not embarrassed to make after watching a movie that focuses on how pangs of hunger drive an entire populace to desperate rebellion. This gochujang peanut pasta salad is perfect for using up all your vegetable leftovers, and it’s amenable to almost any kind of addition you’d like. I’ve shared an immensely popular Gochujang Peanut Asian-Style Pasta before that would use up those leftovers as well, but this time’s recipe is a genuine pasta salad recipe. It’s coated with two layers of sauces–a mildly spicy gochujang peanut sauce and a creamy mayo BBQ sauce–for a layering of subtle flavors that will make you clamor to leave leftovers on the Thanksgiving table this year. The odds aren’t always in ever in anyone’s favor, but every small gesture counts. This pasta salad is my act of defiance, my recognition of our shared humanity and blessings. What will yours be? 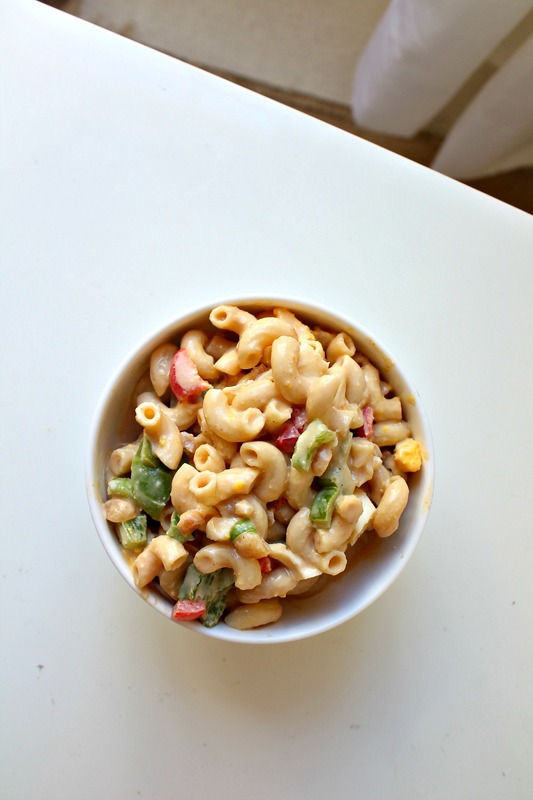 This macaroni pasta boasts two coatings--a peanut gochujang flavor blast followed by creamy mayo--that will amp up any picnic table! 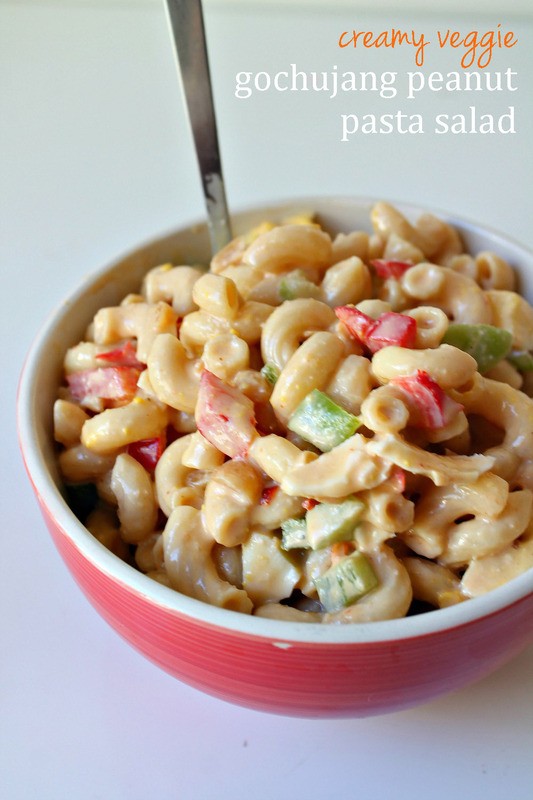 A perfectly refreshing change from your usual macaroni salad, and a great way to use up those extra vegetables from the dinner table! Bring a pot of lightly salted water to a rolling boil. Add elbow pasta and cook as directed, until al dente (about 8 minutes of cooking over medium heat). Remove from heat and strain pasta. Transfer to a large mixing bowl and set aside. As the pasta cooks, place eggs in a second pot, cover them with water, then bring the water to a boil over medium heat. Lower heat to medium-low and cook for 8-10 minutes, until eggs are hardboiled. Set eggs aside to cool before peeling and chopping. Add to pasta. In a saucepan over medium heat, add chopped bell peppers and sautee for 3-4 minutes, until cooked through. I did not use oil, but you may add some for extra flavor. Add to pasta, along with any leftover vegetables you'd like to use up. In a medium bowl, combine peanut butter, honey, 1/4 cup rice vinegar, gochujang sauce, red pepper flakes, and chopped peanuts. Add to large mixing bowl containing pasta. Toss to coat pasta completely. In the same medium bowl, combine mayo, white sugar, BBQ sauce, and remaining 1/4 cup rice vinegar. Add to pasta and toss to coat completely in a second layer. Refrigerate at least 2 hours before serving chilled! I have a terrible confession to make. I have not read or watched any of the Hunger Games books or movies. I can’t bear for people to fight – throw-over from my mixed up childhood – so I was pretty sure they weren’t for me. Your pasta, on the other hand, would suit me perfectly. I think “terrible” is an overstatement, Stacy–that’s a totally fair reason! It’s not the most pleasant of series, though I think there’s something to be said for the message that does come out of all the fighting. I think you’re lovely without the Hunger Games, so go dig up a bowl for pasta salad and enjoy the rest of your lovely Sunday! Oh, you know it! Happy Sunday, Jen! Mmmm….. 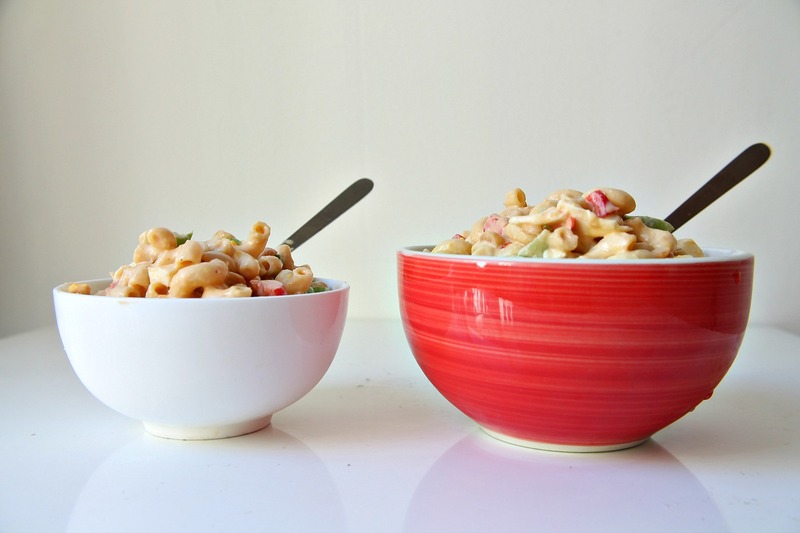 I love pasta salad, and yours is absolutely gorgeous! And you’re a total gem! The pasta’s not a huge looker, to be honest, but it makes up for it in spades with flavor! Hunger and food insecurity are real. We who have so much, have much to be grateful for this Thanksgiving. Using leftovers well is the hallmark of a great cook. It an not only an example of good kitchen skills but shows respect for the abundant food we have. The Peanut Salad is a wonderful example! Deb, your comment meant so much to me. I’m so glad I’m not the only one feeling this way around Thanksgiving time! I also don’t know any other blogger who shows as much respect as you do for your food and its beautiful story. Have a lovely week! Yes, I was expecting more than that from the ending…hopefully they make it better on part 2. Meanwhile, this gochujang salad is drool-worthy and I totally adore he creaminess of this pasta salad. Yum! Gochujang? I’m in — love that stuff! This is such an interesting salad — very creative. Thanks. Thanks, John–I’m with you on the gochujang! Happy Sunday and week! Oooh, when you do finish, hit me up and we can chat! You’re going to love it, Liz–it only took me three days to finish all three! Have a WONDERFUL Thanksgiving! This has be drooling, great looking pasta salad!! Heh–the flavors have me drooling as well. I think it’s high time we had an encore. Happy Sunday, Tara! This dish looks extra creamy and delicious. Yum! Creamy to the max, Jennie! Thanks so much for hosting this weekend, you’re a gem! This sounds SO good. Omg. I love the flavors!!! ….and now I want to go watch The Hunger Games again. Again?! Goodness girl–I’m guessing that means you have already, though. Any quick thoughts on it? I’m desperately surveying folks in the hopes that I’m not the only one who enjoyed it but was also disappointed… 😉 Anyway, happy Sunday, Shaina! I know exactly what you mean about being lost in the stupor of reading The Hunger Games. I read them all for when the first movie came out, and it was a weekend reading marathon because I just had to know what happened next. That is AMAZING that you dressed up as Peeta. I haven’t seen the movie yet, but I cheated and read reviews, and the general reaction sounds similar to yours: that reviewers thought the movie was kinda disappointing but die-hard fans think it’s true to the book. Mockingjay’s my favourite of all three books, I thought it was just really realistic and clear and chilling, so I will reserve judgement until I see it. The thing is, I don’t think luxury/indulgence is a sin, or that doing without will necessarily help the rich/poor divide unless what one is sacrificing is donated/redistributed. There are no easy answers… wasting food Capitol-style definitely isn’t right, but celebrating beautiful food (Peeta would be a fan) is another. As for the homeless not taking food, I’m guessing that’s because in western society we’re taught that anything we eat needs to come from a trusted source. I think the only means we have of getting food to those less fortunate is through institutions/organized activities, like a food bank, soup kitchen or sandwich drive. And last of all, I used to have peanut-noodles like your salad as a kid. Happy memories! Awww, Myriam did I ever tell you how much I enjoy reading your comments? (Hint: it’s a lot!) My friend has my Peeta pics, I’m going to try and post them soon! I hope you do see the movie anyway and report back–I’d love a fellow grad student’s input on the matter. I actually wasn’t as big a fan of Mockingjay for some reason–it felt structurally a bit discombobulated to me–but the movie’s still not bad! It really isn’t. I loved reading your bit about the celebration of food. That’s totally what I try to do with my friends anytime we’re around a table-ful of it, because it really is a great way to bring people closer together! (One of the biggest ways, actually.) It’s just being able to appreciate your food in a way that’s respectful–I think that’s super important! <3 Thanks for all your thoughts, lovely lady! I loved this post. The Capitol’s self-obsession and consumerism often hit a little too close to home. This is my favorite kind of rebellion though. The kind that takes our discontent and our concern, adds in our gifts and talents, and uses that to make a difference. Love. I’m so glad you enjoyed it and agree, Courtney! Watching the movies and reading the books, it felt so hard to empathize because I’ve never been in that situation before (thankfully)–but it felt really easy to sympathize and draw real-world parallels. This is why I’m so glad we do have such a tight-knit group of food bloggers: it’s amazing what beautiful respect and appreciation we can bring to the food we do have! You’re wonderful, Jess–wishing you the happiest of holidays!! This is such a great way to use up all your veggie leftovers! I love the gochujang and peanut butter in here! Looks fantastic! Yes, I bet you’d absolutely love this combo together, Kelly! Happy holidays to you and the lovely family!! YES. Bobbi, I’m so terribly excited for you. I hope you like the gochujang and this pasta if you make it!! Ha, I love that you dressed up as Peeta for the film! I just saw it last night, and loved it. It was a tad slower than previous movies but I still loved it! I am loving the flavor combos of this dish! I have never thought of a cold peanut noodle salad! This one sounds amazing and looks delicious! I have not yet seen the movie…much to the horror of my 19 year old daughter but I loved the books. I think it is wonderful that you dressed up to go! I, also, love how you used the Thanksgiving veggies so that they do not go to waste! Ala, love this!! 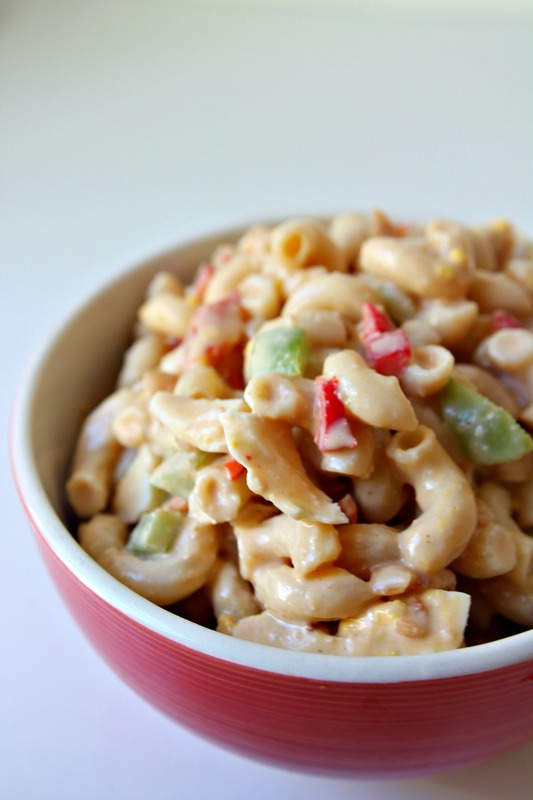 I love using gochujang in unexpected ways. . this pasta salad looks so good!!! Pinned this one! Well, of course I like this dish! There is never a shortage of gochujang in my house. Great “pantry” dish! Interesting flavor combo I never tried red pepper paste and peanut butter but I’ve heard it is wonderful together. I must try your version! It really is, Cindy! You’re going to love love love it. Have a wonderful week! hanks so much, Sarah! Happy Monday! Ooooohhhh my gosh I want this pasta SO MUCH I can’t even handle it. It looks so, so good. I’ve never had PB with gochujang but I need to try it ASAP, I’m convinced. And such a necessary reminder that hunger is a real problem, not just a backdrop to a glamorized love story. (One that I will still probably see. Cheesebunz4eva.) It’s so so easy to forget things like this, especially when we’re trying to fit that one last bite of pie in over Thanksgiving. Such lovely words — thanks for sharing, friend! duuude gochujang + peanut = meant to be. Seriously. And I’m glad you enjoyed the post because even as I was writing it, I felt like such a total fraud. Who am I to talk about these issues when millions of people out there are living them every day? To that end, we do what we can with what we have. Guess this is my outlet! I want a bowl!!! This looks absolutely divine! hehe thanks so much, Julie! I’d definitely whip up a bowl for you! I’ve been meaning to comment on this post for the longest time, and just managed to get around to doing so! I love gochujang. Probably because I love all things Korean and gochujang, well, seems to be their main ingredient for sauces. lol. 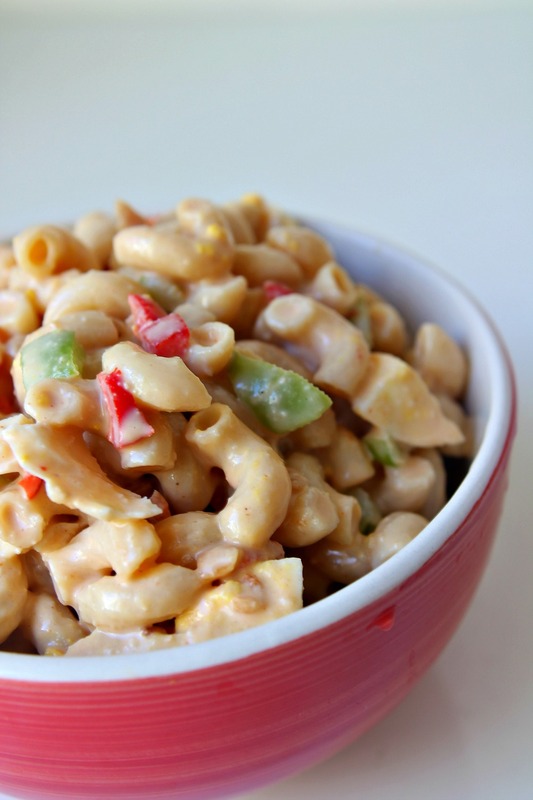 This pasta salad looks so amazingly delicious, and I love that you combine it with peanuts and BBQ sauce. Way to go in creating brand new flavors! =) Can’t wait to try it! Haha! Thanks, Andrea! I really do adore this recipe, hope you do too!